1. 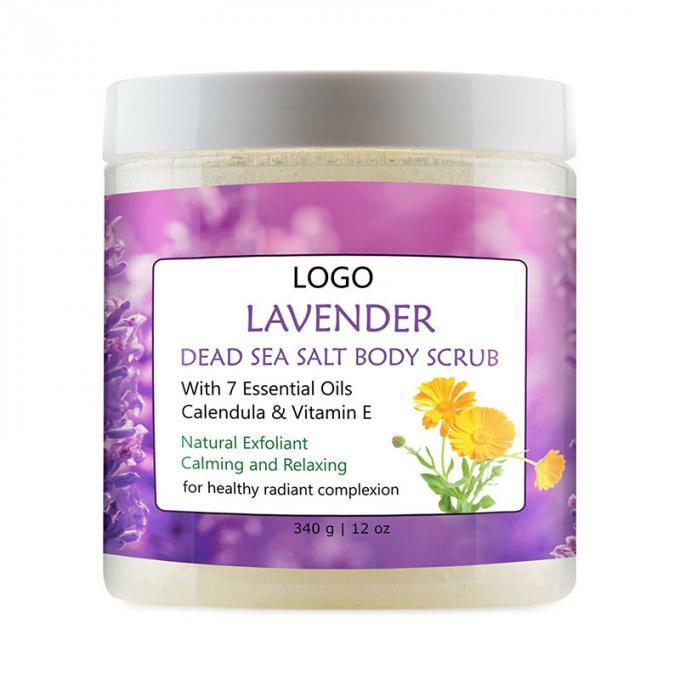 Lavender Ded Sea Salt Body Scrub naturally exfoliates while calms and relaxes. Infused with 7 essential oils - Lavender oil, Sweet Almond Oil, Jojoba oil, Apricot oil, Grape Seed oil, Avocado oil, Sunflower oil, known for their anti-oxidant, fatty acid-rich qualities. 2. 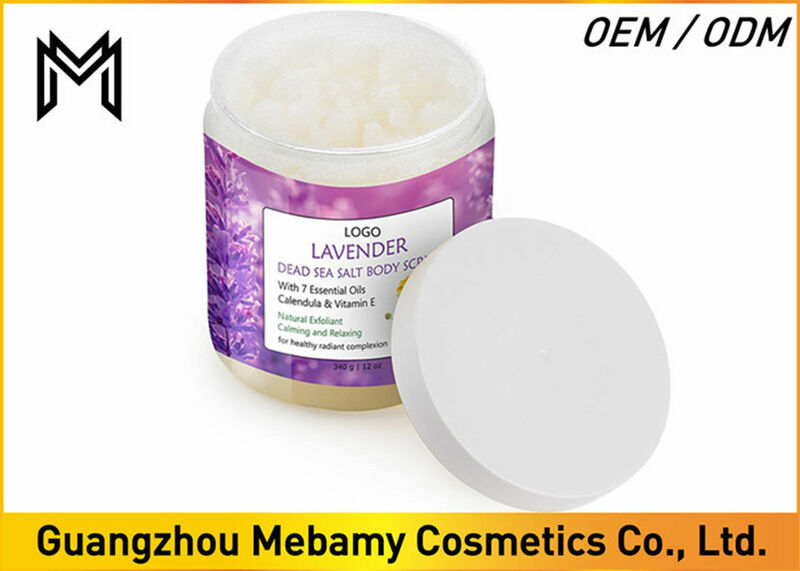 Loaded with Dead Sea Salt known for its theraputic effects, Calendual Flower Extract know for its healing, anti-inflammatory and antibacterial effects, and Lavender Essential oil known for its aromatic and calming properties. Perfect for morning or evening use. 3. Promotes healthy and radiant complexion. Not too greasy, with just the right amount of salt and oils. 4. 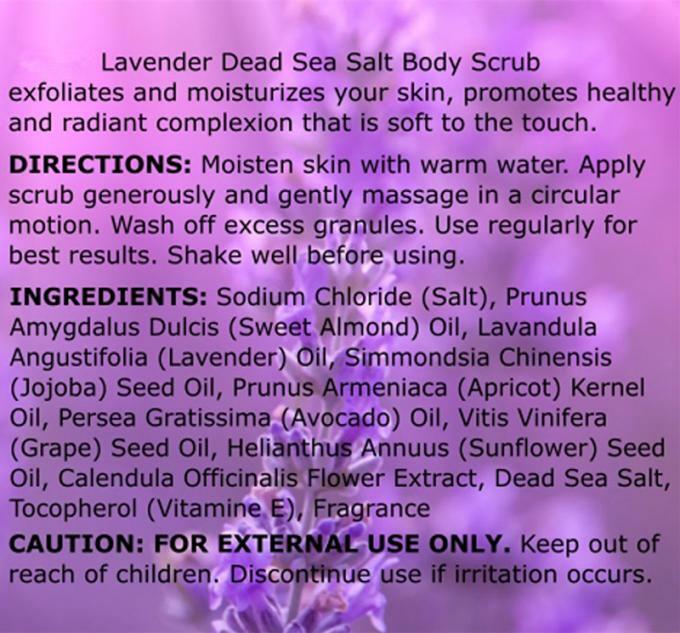 Exfoliates and moisturizes your skin leaving it smooth and conditioned. Unveil irresistible fragrant aroma of Lavender body scrub. Infused with healing Calendula Flower extract, it effectively exfoliates and moisturizes your skin! Infused with natural oils and vitamin E, loaded with Dead Sea Salt known for its therapeutic effects, Evarne body scrub helps to exfoliate and moisturize your skin leaving it smooth and conditioned. Crafted with natural ingredients such as Lavender oil, Sweet Almond Oil, Jojoba oil, Apricot oil, Grape Seed oil, Avocado oil, Sunflower oil, known for their anti-oxidant, fatty acid-rich qualities. Promotes healthy and radiant complexion that is soft to the touch. Not too greasy, with just the right amount of salt and oils, our scrub is perfect for morning or evening use. Directions: Moisten skin with warm water. Apply scrub generously and gently massage in a circular motion. Wash off excess granules. Use regularly for best results. Directions: Moisten skin with warm water. Apply scrub generously and gently massage in a circular motion. Wash off excess granules. Use regularly for best results. Used For Exfoliate and moisturize your skin leaving it smooth and conditioned.